LDS SLAM: The laser scans the cleaning environment with a high speed achieving more accurate location recognition and map creation. Vision SLAM: Extract image feature information and modeling to assist relocation. Even if being moved, it can continue to clean the unswept area during the task. Xiaomi Mijia 1S Robot is featured with an AI image recognition function. It now recognizes rooms by understanding where the door of the room is. 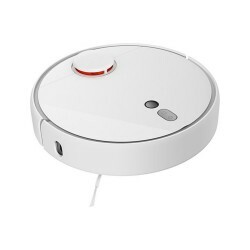 Xiaomi Mijia 1S Robot can vacuum where dirt, dust hide and even large debris like cereal from wherever it hides, navigating around furniture and under beds, corner trash and other hard-to-reach places. Set the cleaning or non-cleaning area on the APP map, set the target, Roborock will build the cleaning map automatically on the way. APP Virtual Wall,you can draw the slices of virtual wall and prevent the robot vacuum from crossing. Runs for up to 2.5 hours, then automatically returns to its charge base to recharge and resume cleaning the unfinished work. Help you connect to clean from anywhere, make presets to clean on a schedule, view maps of where your robot cleaned, and more.